Fall is truly in the air! Leaves are beginning to change with peak foliage in the Finger Lakes expected to be around Columbus Day weekend and perhaps a bit longer. The colors now are at about 25% with oranges, yellows and some reds. Central New York residents get to enjoy these beautiful colors and watch nature change her clothes up close and personal. Residents and visitors alike amble out to the quite roads, lakes, and villages to drink in the richness of the colors and see spectacular displays. Skaneateles is no exception to the brilliance of color in the Finger Lakes. The vistas and horizon is coming alive with the colors of fall. It’s no wonder Finger Lakes vacation rentals are in full swing once again. We love visitors to our area and look forward to welcoming you into one of our magnificent Skaneateles luxury rentals. Our beautiful Village of Skaneateles offers some of the most sought after shopping, dining, art and lakeside activities. Our location lends well to day trips out and about around the lakes to take in the sights. 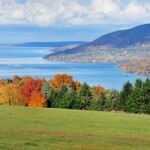 Finger Lakes vacation rentals puts you right in the middle of the best scenery and colors of Fall. October is a wonderful month to get your fill of nature in the cooler air, visit our weekly Farmer’s Market for fresh, local produce and embark on the ongoing wine tours. When you are looking for places to stay in the Finger Lakes, Skaneateles luxury rentals has you covered. Our beautiful and welcoming properties are situated close to town and often within walking distance. Each private home has been remodeled and appointed with luxury furnishings. From beautiful large kitchens, family-friendly living space, private bedrooms with views and even a pet-friendly property, there is a vacation rental with your name on it. Our property on Skaneateles Lake/Greenfield is one excellent example of the quality of our Finger Lakes Luxury Rentals. With three bedrooms, 2.5 bathrooms, 3000 square feet and lakefront, this property is one of our favorites. The kitchen is generous with granite countertops, and plenty of space to cook. The well-placed breakfast bar allows for ease of conversation and the feeling of everyone being together as it looks out into the expansive living area. The deck and windows provide beauty, views and sunlight. 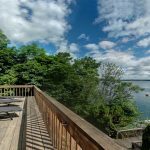 It is situated on the west side of beautiful Skaneateles Lake and just a five minute drive away from downtown Skaneateles. It is located one mile from Anyela’s Winery and only two miles from Skaneateles Country Club. The beautiful sunrises from the patio are absolutely magnificent! There is a dock, mooring buoy and 80′ of private lakefront for you to enjoy! On the main level there is an open floor plan with a spacious living room with gas fire place, modern kitchen with granite counters, dining room, screened in porch and half bath. The second level has a master bedroom with king bed, guest bedroom with queen bed, guest bedroom with two single beds and full bathroom with steam shower. On the lower level there is another spacious living room, full kitchen, billiards area and a full bathroom. There is always something to do in the Finger Lakes, and the Autumn season is no exception. The local activities can be found at Fingerlakes.org as well as our Village’s site at Skaneateles.com. This is a perfect time to visit the vineyards as they harvest and provide tours of their wineries where you can sample the fruits of their labor. Come see the colors change magically before your eyes as Fall emerges and puts on her fancy clothes. Skaneateles vacation rentals is waiting to welcome you to your home away from home!